Goldyear is attending 2012 Japan Lighting Fair in Tokyo Big Sight, March 6th-9th (Booth no. LD1081-6), and 2012 Taiwan International Lighting Fair in Taipei, March 13th-16th (Booth no. B1128 & B1227) with a huge range of new and exciting products. Goldyear developed innovative 6 in 1 lens technology with new Nichia chip, which gives our new MR16 and GU10 items much cheaper price and brightness, and we’ll display MR16 with brand new CREE XBD chip during these lighting fair. 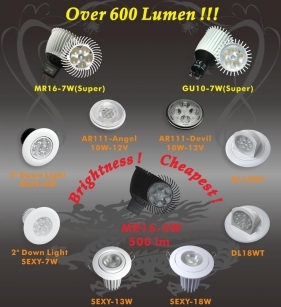 Presented will be the full range of High Power LED lighting fixtures, including SUPER MR16 with over 600 lumen, Cheapest and Brightness MR16 (E11 Based) with Nichia Chip, several new design of AR111 (include 8 Degree lens design)and Swivel DL12W-T & DL18W-T. Also on display will be the compact “UFO" 13W dimmable LED luminaire, the uniqe and chic design created by Goldyear. Join us and talk to our specialists and get the inside line on tomorrow’s lighting.